It’s enough to make anyone feel a little overwhelmed. That’s why it’s important to sit down at the start of each year and figure out exactly what you want—or rather need—to focus on first. Because, as any marketer can tell you, prioritization is a tricky beast. There’s always so much that you could be doing, it’s hard to know what you should be doing. Source: The 2019 Page Speed Report. Of course, every item on this list is worth doing if you have the capacity to do them all. But one result here really caught us off guard: only 3% of marketers say they will be focusing on ensuring faster website loading times in 2019? It’s at the absolute bottom of their list of priorities?? That’s bonkers! Google keeps signaling this is the year of page speed, after all. If you focus on some of this other stuff first—while your pages keep loading slowwwww—then you might accidentally end up driving up the cost of your ad clicks and conversions. With that in mind, today we’re going to dive into the reasons why marketers say these priorities are so important—and why you might need to consider rearranging your to-do list for 2019. Like this graph? Be sure to check out the full version of our Page Speed Report for more insights and examples that show you exactly how slow load times might be killing your conversions. 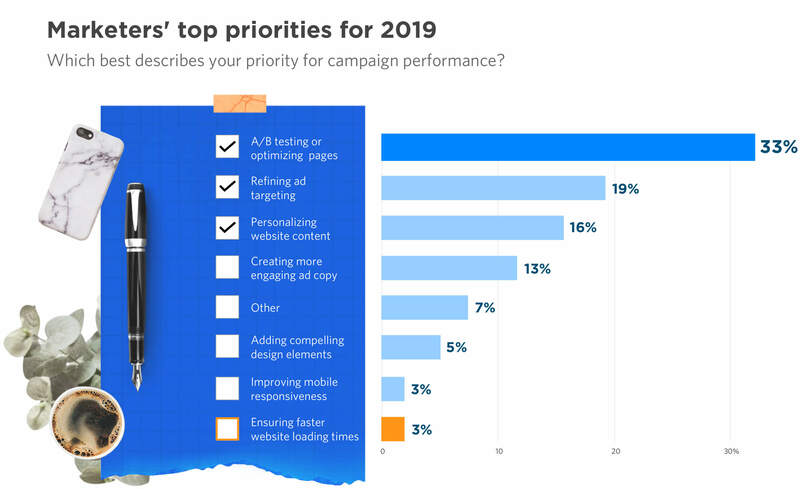 We’ve written a lot about why A/B testing is important, so we’re not surprised that most marketers list it as their number one priority for 2019. You should absolutely be running tests on your websites and landing pages to optimize them for conversions. This is what will give you the edge over the competition and drive down the cost of your PPC ads—right? Here’s the problem: proper A/B testing takes time to pull in adequate sample sizes and to get statistically significant results. And the longer you take to test and optimize your potentially slow-loading variants, the more your pages are going to bleed conversions. In fact, for every second a page takes to load, conversions drop by 12%. Overall, you have to ask yourself: will anything you’re testing on the page itself have as big of an effect as speeding up its load time? What’s worse, some A/B testing tools actually have a negative impact on your load times, making your campaign pages even more sluggish than before. According to one test done by ConversionXL, implementing a third-party A/B testing tool can cause your page speed score to drop by as much as 12 points. Yikes! So while A/B testing is a great way to see what’s working (or not) on any given page, we’d suggest moving this down on your marketing priority list for 2019 until your pages are optimized for speed, first. You’re paying big bucks every time someone clicks on one of your ads. So one thing you want to be sure of is that the people who do click on them are actually the right types of qualified leads you want to be attracting. Christi Olson, Head of Evangelism for Search at Microsoft, recently told Search Engine Journal that having a well-thought-out segmentation and audience targeting strategy is going to be what separates the “best-in-class” marketing experts from the “average Joes” in 2019. But if you don’t provide a fast-loading landing page experience along with your terrific ad targeting? You’re still going to end up paying more for your ad clicks. Google clearly states that slow page speeds will have a direct and negative impact on “your Ad Rank, and therefore your CPC and position in the ad auction.” So while refining your ad targeting is now more important than ever, what you really need to do first is make sure your landing pages don’t take f-o-r-e-v-e-r to load (even before you start fiddling around in your Google Ads account). Remember: great targeting can amount to nothing if your visitors click an ad and run up against a slow-to-load page. See how Unbounce helps you automatically optimize every landing page you create, without the need for a developer. Marketers want to focus on personalization in 2019 because they know the more generic a website is, the less likely it is to convert. 61% of people expect brands to tailor experiences based on their preferences, and 90% of leading marketers say personalization significantly contributes to their business profitability. So this one has to be a top priority—right? 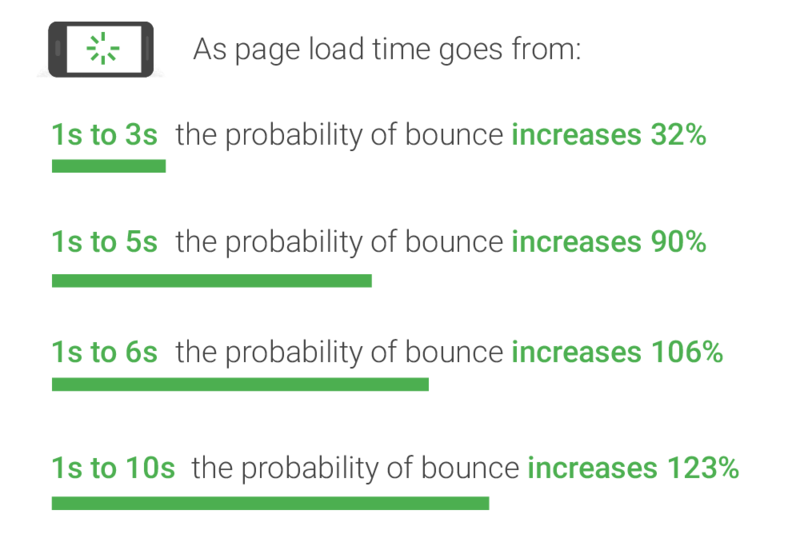 According to Think with Google, the longer a page takes to load, the more likely a visitor is to bounce. This means that if your landing page loads slower than the recommended 3 seconds, people are going to start bouncing before they even get a chance to see your content—no matter how personalized it is! The end result? You’re going to have more frustrated visitors leaving your website without buying anything, a higher cost per conversion, and a bunch of super duper personalized content that gets completely overlooked. Let’s get back to basics, then: 13% of marketers we surveyed say they are looking to spend their time this year creating more enticing ads. This is something that is so so so important for your PPC campaigns, especially with the latest expanded text ad formats. Clear, clever, and engaging ad copy will help you stand out from the competition, drive more leads, and directly impact your bottom line. At the same time, similar to ad targeting (priority #2), your ad copy is only one piece of the Google Ads puzzle. Fast page speeds are also vital for campaign landing pages, especially for visitors who are using mobile devices. The numbers don’t lie: mobile sites that load in 5 seconds earn twice as much revenue as mobile sites that take 19 seconds. Similarly, fast-loading sites earn 25% higher ad viewability and 70% longer average sessions. This means that if you want your marketing campaigns to be successful in 2019, you’re going to need both compelling pre-click ad copy and fast-loading post-click experiences. Remember: your ads and landing pages are an inseparable duo, so it’s smart to prioritize more engaging ad copy along with faster load times. For more info, check out our tips on How to Write the Best Google Ads Copy & Back It Up on Landing Pages. Here’s the thing though, while these types of design flourishes can make your landing pages look good—they’re also kinda dangerous. Research shows that on most mobile landing pages, it takes more than 5 seconds for visual content above the fold to display. Considering more than half of visitors bounce if a mobile page takes longer than 3 seconds to load, that’s a big problem. Half of all people would be willing to give up animation and video for faster load times. If you have page speed at the bottom of your to-do list, then you might have alarm bells going off in your head right now. Load times are critically important to your conversions (the thing we work so hard for in the first place), so that’s why we’re urging you to rethink your priorities for 2019. Make sure you check our Page Speed Report to learn more about all the juicy stats and trends that make it clear why faster page speed belongs at the top of your list. But hey, that’s just, like, our opinion, man. You’ll know better than anyone else which areas can make the biggest impact on your business. Leave a comment below and let us know what you think, and what you’re prioritizing in 2019.